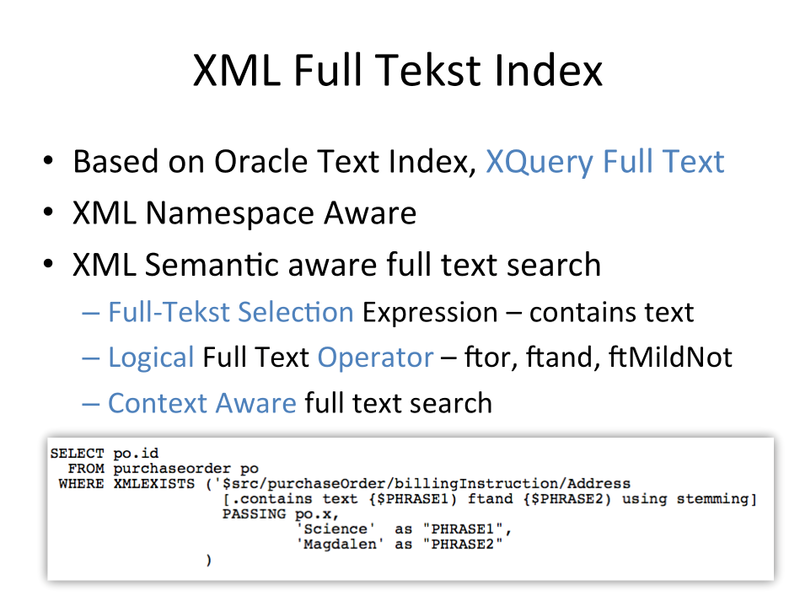 New in Oracle 12c and one of the big new features in XMLDB is the XQuery Full Text functionality and, as mentioned in the post about XQuery Update, is the official W3C standard to handle unstructured pieces of XML content. The XQuery Full Text and XQuery Full Text Index extends the XQuery XMLDB language to efficiently and XML aware handle unstructured content in XML. So finally in Oracle 12c, we are able to handle “structured”, “semi-structured” and “unstructured” content, XML aware and based on standards, across the board with regards to XML content. FTLanguage (unsupported) – The language used is the language defined by the default lexer, which means the language that was used when the database was installed. FTStopWordOption (unsupported) – The stoplist used is the stoplist defined for that language. SELECT xt1.PAGE_TEXT as "Wikipedia Content"
During tests it proved very fast on English Wikipedia content (10++ Gb) and delivered the results within less than a second. But such a statement will only be picked up very efficiently if the new, introduced in 12c, corresponding Oracle XQuery Full-Text Index has been created. Index preference BASIC_STORAGE specifies the tablespace and creation parameters for the database tables and indexes that constitute an Oracle Text index. Oracle Database 12c: Oracle XMLDB is now Mandatory!